Sali Hughes is top of the list when it comes to highly professional skincare and makeup idols who I listen to intently while going through my weekly mani routine, or as I string together handmade jewellery. Her series titled "In the Bathroom with..." is as perfect as it gets to being my ideal Friday night in. I whisked through Sali's beauty book called "Pretty Honest" since her professional career as a columnist for the Guardian newspaper proves that she is a talented, witty and totally addictive author. I love her personality and I completely identify with her minimalist beauty look, chic hairstyle, and honest demeanour. When Sali Hughes tells me that something is key for "on the train" makeup, I'll go buy it. During her visit in the London bathroom of Wendy Rowe, Artistic Consultant at Burberry Beauty, (Part 1 & Part 2) I was filled with so many beauty tips. A few days later, this stunning eye shadow stick practically jumped into my hands at Sephora, and it's been true love ever since. I purchased the Urban Decay 24/7 Glide-On Shadow Pencil in Rehab when I was on a trip to New York in 2012 (documented here). Yes, 4 years ago, and I still use the darn thing. That's the benefit to pencils - freshness returns once sharpened down, and the good ones hardly ever dry out. These Urban Decay shadow sticks have been my quick fix for a daily eye look, and I am absolutely heartbroken that they are discontinued. 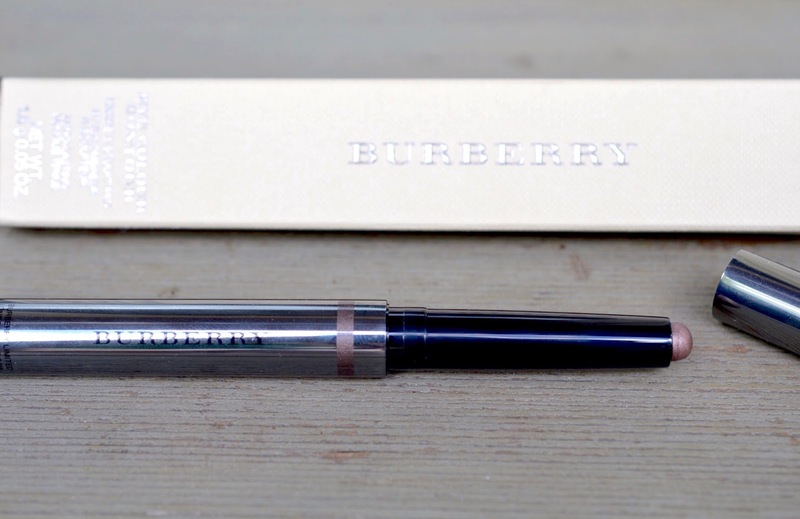 Fortunately, the Burberry Eye Contour Pen in 116 Dusky Mauve (shop) totally compares. The twist-up, high-quality packaging is far more convenient than sharpenable pencils, and the colour glides on like soft butter. This "chubby liner" dries down to a budge-proof pigment that looks divine, especially on greeny-brown eyes. This shade is unique, and beyond stunning. A warm browny-mauve with a touch of plummy-taupe and a flash of warm bronze when it's in the right light. This is the quickest, subtle smoky liner you'll ever find. At a whopping $32 CAD, the price is shocking, but I know that this pencil will last me a very long time. I truly admire Sali Hughes as an accomplished professional in the wild world of Beauty. It's so fun to have a little bit of luxury in your life, and this high-quality workhorse is the perfect fit for any busy lady's makeup bag.